Round Diamond Halo Vintage Engagement Ring with Pave-Setting | Shane Co.
A gorgeous vintage-inspired engraving beautifully accents this halo engagement ring both on the profiles and sides of this 5.5mm engagement ring. The setting is also dazzled by the collection of both 52 round diamonds (approx. .46 carat TW) and two baguette diamonds (approx. .11 carat TW). Both channel setting and pavé setting are styles found in this design while accompanied by an elegant milgrain detailing. 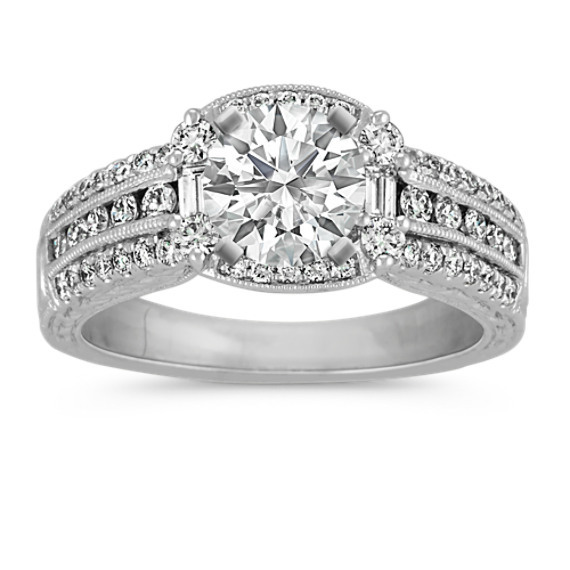 To complete this halo setting, add the center .75 carat center diamond of your choice. This engagement ring is part of our exclusive Couture by Shane Co. collection and has a total diamond weight of approximately .57 carat. Gemstone Carat Weight :5/8 ct. t.w.